We are the Champion and We are the Champion. 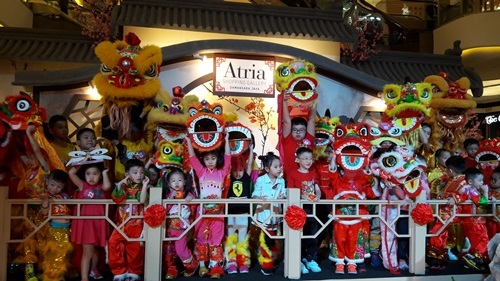 I'm proud to announce that 2-Junior-Rangers were the Champion for the Kids Lion Dance held recently at Atria Shopping Mall. I'm WH will be reporting my experience at this post. I love Lion Dance so much since I was just a little boy. My Mom at first don't agreed for me to learn the movement because I was too small and she afraid I will lost my concentration in study but I never give up. I persuade my Mom till she give up and let me learn at my school. Every lesson that I attended, my Mom will pay RM10 coz' most of the times, my Mom was too busy to fetch me there. When I was in Standard 5, lion dance is part of my co-curriculum and I faster register for it. Every Friday is the moment that I always looking for coz' after my school, I could join the lion dance class for an hour. After a year of training holding the lion dance head, me and my friends were send to Pavilion to perform during the World Lion & Dragon Extravaganza in conjunction with Visit Pavilion 2018. The Star paper had published our winnings out. Their article at this link https://www.thestar.com.my/metro/metro-news/2018/02/15/young-lion-dancers-wow-mallgoers-siblings-prance-their-way-to-top-spot-in-festive-competition-that-d/. 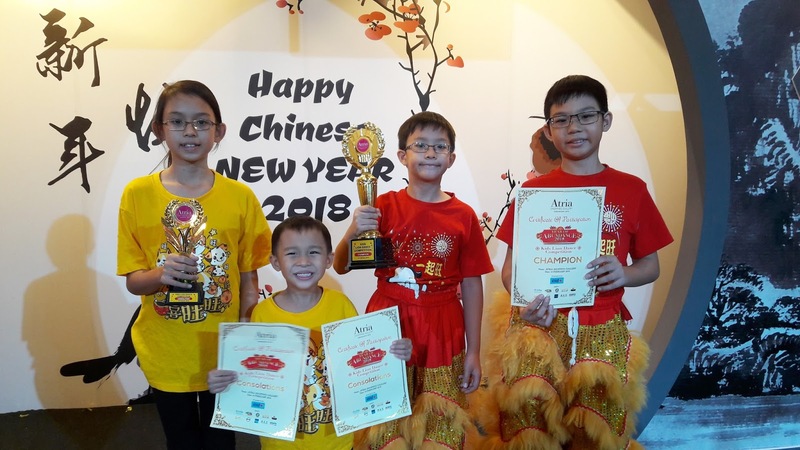 This year, I will be in Standard 6 and because the school wanted us to concentrate on our UPSR, all the students at my level unable to join the Lion Dance co-curriculum. I was a bit sad coz' it is my favourite and I wanted to learn more. 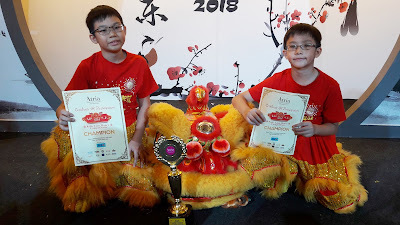 Touched by my determination, my Mom had asked a coach from Kok Hing Dragon & Lion Dance Association to teach me and my brother since January this year. At first my coach, Eric Chin rejected us because we are too small and all their students are at least in college but Mom persuade Eric to teach us. She showed to Eric my performance at Pavilion and that I have the quality to learn it. 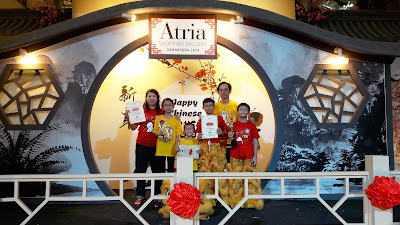 Eric, finally agreed and said will train me and my brothers for the Kids Lion Dance Competition which will be held soon. We started the lion dance movement the following week and every Friday night, from 9pm+ to 10pm plus, we will start our training. Eric was kind enough to borrow the lion dance mascot to practise at home. We were so happy when we able to bring back the mascot that we always had wanted home. We practise it at home after our school and tuition. To join in the fun, my Sister and my youngest brother form another team. Due to schooling on Sat, my Sister only able to practise 2-3 times where else, me and brother practise around 5 times for the competition. My Mom helped us to register my group name as "Loh's Brother" and my Sis group name as "Mighty One". Check out our video at the link HERE. On the day of competition, we a bit nervous. After fetching my Sis from school, we rushed to Atria Shopping Mall to join the competition. There are lots of kids wearing beautiful costumes and prepared to roar the stage. When our turn comes, we just do our best to impress the judges. The moment came when they announce the winners. My Sis and my youngest brother won consolation prize and we never thought that we will be declared as the Champion. 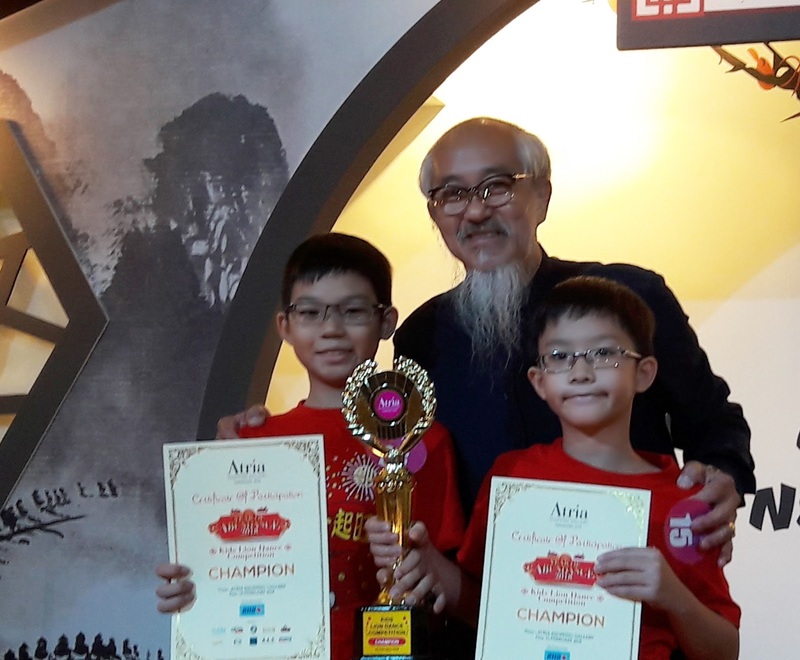 There are many talented kids who compete with us and we were glad that we had won it instead. Thanks to my Mommy and Daddy for your support that made us the winner. Thanks also to Coach, Eric and his student for teaching us the movement to made us the Champion. 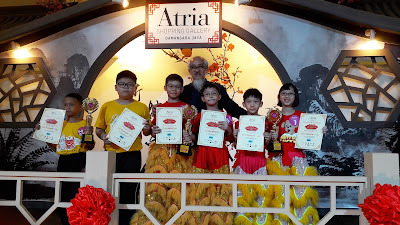 Thanks to Atria Shopping Mall for the opportunity for us to shine at this activity and to motivate the young generation to continue with the tradition and thanks to all my readers who had read my post here. Hopefully I will do it better and be the Champion of the Champion for the Lion Dance Movement.